Now create your own iPhone ringtone from your favorite music or video without ever buying from iTunes Store! Virtually all video/audio formats are supported – AVI, MPEG, WMV, DivX, MP4, H.264/AVC, AVCHD, MKV, RM, MOV, XviD, and 3GP plus audios like MP3, WMA, AAC, WAV, RA, M4A, and AC3. 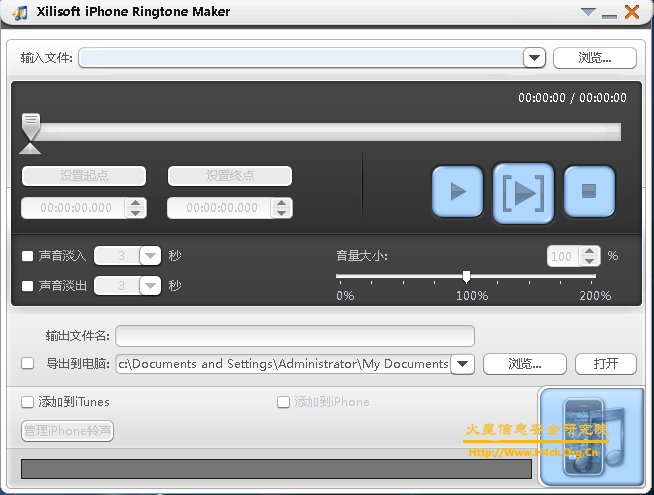 With the smart iPhone ringtone maker, you can even transfer the converted file directly to your iPhone (iPhone, CDMA iPhone 4, iPhone 3G, iPhone 3GS, iPhone 4) without going through iTunes. Click here to download the patch! Click here to download the program file! 10067B58   \68 282F0B10     push imfc0.100B2F28                               ; ASCII "charge"